Alex is under so much pressure to solve these three grim cases that he hasn’t noticed that someone else investigating him-someone so obsessed and so twisted that they’ll do anything-ANYTHING- to get the vengeance they require. Alex Cross, Run is James Patterson’s most unrelenting story yet-a white-hot, sensational thrill ride with the most extreme and gripping characters Patterson has ever brought to life. 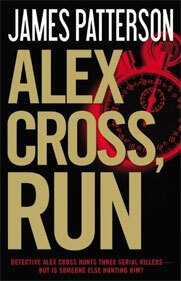 For me, James has struck gold with the latest installment in the Alex Cross’ series. Yes, he revealed who the three perps were early on but I didn’t mind at all. Their story played out remarkably well. His characters had depth again which I felt were lacking in some of his other stories as of late. Once again, I found myself longing for a few more pages. Marvelous job, JP!